paciey 1-1/4 pints. Weight (all in) 18-1/4 troy ounces. Block monogram on on side: C/WK (could be erased). Overall and mark condition are excellent (a little fire scale). His Woolsey pattern. 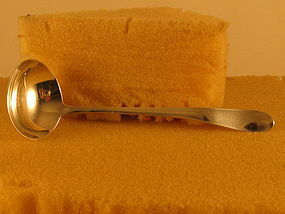 Sides divided into five segments, reeded and shaped top edge, molded ring base. See our #4806 for same design and size, but without ring base. Diameter 10". Height 2-1/8". Weight 22.2 troy ounces. No monogram. Overall and mark condition are excellent. 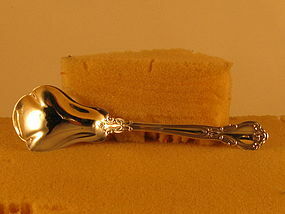 Chinese soup ladle by KHC, 3rd quarter 19th C.
Shell on front and back of handle; fiddle thread. Round bowl. Length 13". Bowl diameter 3-5/8". Weight 8.4 troy ounces. 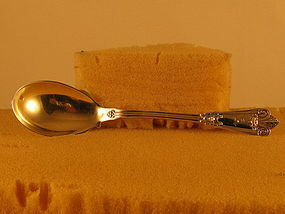 The monogram is a script M on the front of the handle. Marked KHC in a rectangle and an ideogram. Overall and mark condition are excellent. Coffin end, length 6-1/4", lengthwise script monogram ER. Overall and mark condition are excellent (bowl tips near mint). Turned top edge. On a base. Diameter 8-1/2". Height 4-1/2". Weight 14.3 troy ounces. 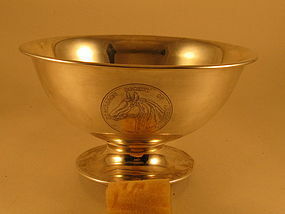 Engraving on side of bowl is a 2-1/8" circle containing a horse's head and an inscription around it, "PERCHERON SOCIETY OF AMERICA CHICAGO". Engraved on the bottom is: "CHAMPION TROPHY/OFFERED BY/THE PERCHERON SOCIETY OF AMERICA/FIVE STALLIONS OWNED BY EXHIBITOR/OREGON STATE FAIR/SALEM-OREGON 1915" and then the names of the horses and of the recipient. Length 6". No monogram. Overall and mark condition are excellent. Pattern introduced about 1880. Length 6-7/8". The monogram is an A. Overall condition is excellent. Mark condition is good/fair. Length 5-1/8". No monogram. Overall and mark condition are excellent. Hammered finish, 3 tines shaped and pierced. Length 8-5/8". Weight 1.9 troy ounces. The monogram is an applied, stylized S. Overall and mark condition are excellent. 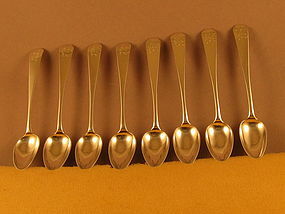 4 tines, the left one thick and shaped. Shell at end of handle (applied?). Length 9-1/2". Weight 3.2 troy ounces. The monogram is a stylized AMM, underlined (applied?). Overall and mark condition are excellent. Mark looks like Chickering *83. Mid-19th century. Olive pattern. 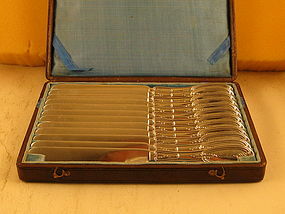 Flat handles, silver blades. Crittenden probably the retailer. Length 7-7/8". Weight 1.7 troy ounces each. Overall and mark condition excellent (including the box). Straw&Lovejoy was the retailer. 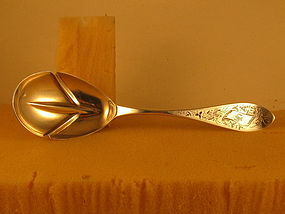 Engraved design on top of handle, shaped bowl, pointed end tipt on top.Length 8-1/2". 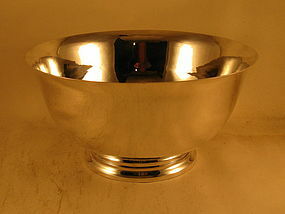 Bowl length 3-1/4";width 2-1/8". Weight 1.8 troy ounces. 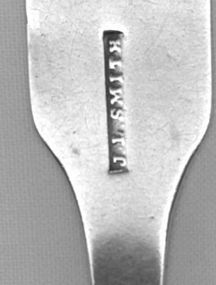 The monogram in a cartouche is an Old English S. Engraved on the back is the date Dec. 18th 1874. Overall and mark condition are excellent. 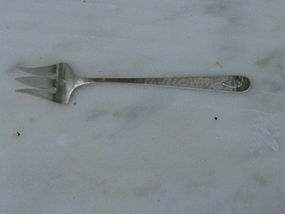 Rounded end, no decoration except hammered finish. Length 6-3/8". No monogram. Overall and mark condition are excellent. Punch bowl by Gebelein, 1933. Handwrought. Revere-style. Diameter 11". Height 5-1/2". Weight 44.1 troy ounces. No monogram. Overall and mark condition are excellent. 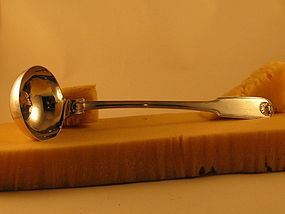 Downturned handle, fiddle. Length 5-3/8". The monogram is a script IO? Overall and mark condition are excellent. 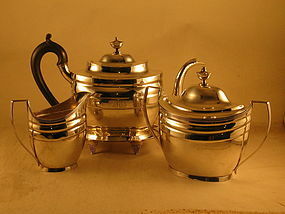 Also marked HAND MADE and STERLING. Hammered finish. Single scroll handles. 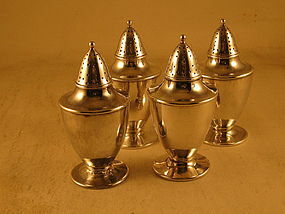 Length over handles of sugar bowl 5-3/4". Length of cream pitcher 4-3/4". Weight of pair 7-1/2 troy ounces. 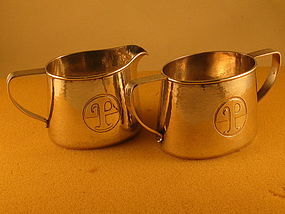 The monogram on the side of each is a stylized letter P. Overall and mark condition are excellent. 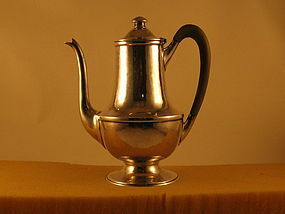 Urn-shaped. Made by hand. Height 4-1/4". Weight 4-1/2 troy ounces. No monogram. Only one marked - by hand. Overall condition is excellent except that one of the four has been nicely repaired underneath the base.